Give your self an easy make over. Laser Bleaching, uses light energy to accelerate the process of bleaching in a dental office. Clinical trials have demonstrated that Laser light is the best source for producing optimal treatment results. 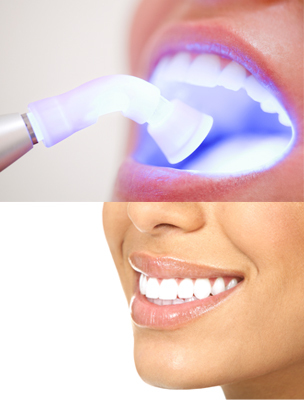 Laser Whitening is the ideal source of high energy to excite the peroxide molecules without overheating the tooth. Recent technical advances have minimized sensitivity and increased efficacy, allowing a less time-intensive patient procedure. Most power teeth whitening treatments can be done in approximately 30 minutes to one hour, in a single visit. Treatment duration and recommendations may dependent on the condition of your teeth at time of treatment. If heavy staining or tetracycline damage is present on a patient’s teeth, there are other methods of whitening teeth that can also be performed to mask staining. Veneers can also mask tooth discoloration. Individuals with sensitive teeth and gums, receding gums and/or defective restorations should consult with their dentist prior to using a tooth whitening system. Beware of over the counter bleaching agents that may damage tooth enamel. This is especially the case with home remedy whitening products containing mild acids. • Whiter teeth brighten your outlook in life. • Yellow teeth, an unnecessary sign of aging! • Looking good but smiling bad?